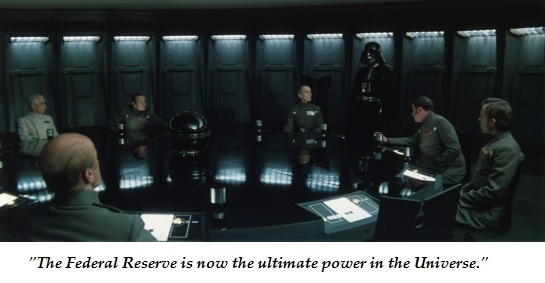 What can we say about the Federal Reserve's policies that hasn't been said a million times? How about simplifying the two primary purposes of Fed policies? I will cover one today and the second one tomorrow. Both involve feeding the 99.5% to the financier/ Wall Street/bank sharks. In the above entries, Harun explained how the Fed's money creation has leveraged a global bubble in assets. At 72-to-1 leverage, the Fed's $3.3 trillion money expansion has generated inflation as well as asset bubbles, though the Fed and its cronies deny both asset bubbles and inflation. Inflation is the Fed's explicit, stated goal. The Fed wants prices to go up because that raises GDP (gross domestic product) and makes debt cheaper to service every year. But alas, real income isn't keeping pace--it's declining. Median household income is down 7% since 2000, but if we strip out the top 1% households, the decline for the bottom 99% would be more than 7%. 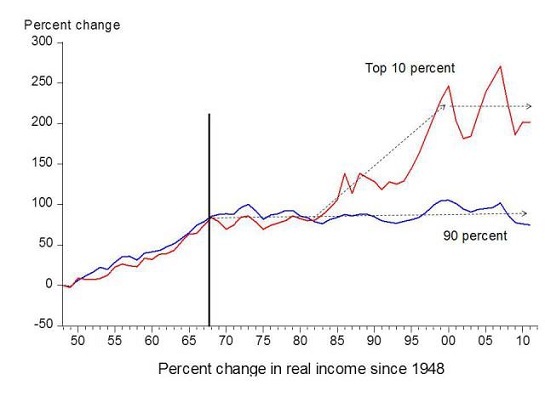 And if we strip out the top 10% households, the decline of the bottom 90% of households is much more than 7%. 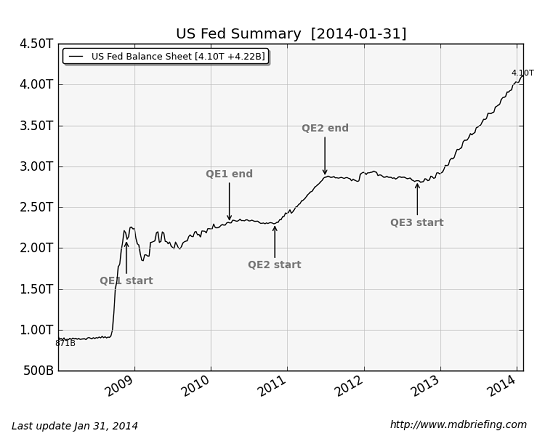 So the Fed is robbing the purchasing power of our money as a matter of policy. In simple terms, the Fed is stealing purchasing power and delivering the stolen wealth to the financiers and banks, who borrow money from the Fed for near-zero rates of interest. And what do the banks do with the money the Fed stole from us? They loan it back to us at 16% (or more). Those of us who haven't just emerged from bankruptcy get offers from banks on a weekly basis: for transfers of credit card debt, new credit cards, cash advances, auto loans, home equity lines of credit, you name it. A recent offer from a Too Big to Fail bank offered a teaser rate of 0% for a few months, after which the credit card's interest rate reverted to 16%. This is how the Fed rebuilds the TBTF banks' insolvent balance sheets: it strips purchasing power from wage earners and savers and gives the banks free money which they loan to debt-serfs for somewhere between 5% and 24%, depending on the length of the loan and the collateral (or lack thereof). As Harun explained, the Fed steals our wealth, transfers it to the banks who then loan our money back to us at 16%. It almost makes you wish the Fed would just steal the money openly and give it to the banks and top .01% of financiers directly, without the sleight of hand of inflation and zero interest rate policy (ZIRP). If the Fed is so powerful, why is it so cowardly and fearful that it has to cloak its theft of our money and its transfer of the wealth to the banks? What's it so afraid of? That we might wake up to the fact that we're being Fed to the sharks, every day, one morsel at a time?